Peppermint Candy Cane Cookies taste like peppermint candy but are simply candy cane sugar cookies and are the best Christmas cookies! Peppermint Candy Cane Cookies are some of the best Christmas cookies I’ve ever made. 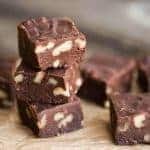 They require a little more work than your typical roll and cut sugar cookie and are definitely not as easy to make as a quick five minute fudge, but I guarantee that these peppermint cookies will be loved by all. If you’re new to my blog, welcome! If you’ve visited before, you’ll know that I’m not only a food snob, but I can be a little OCD about food at times. 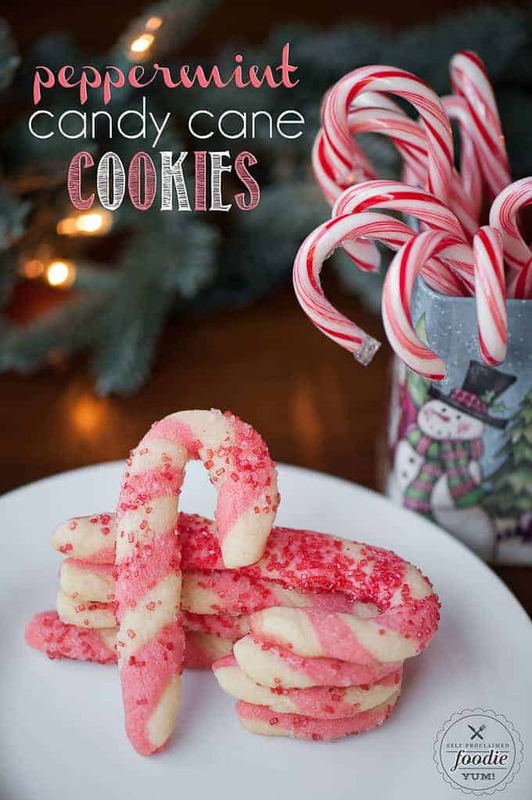 Do these candy cane cookies have to be exact? No. Do I get completely freaked out about proportions and perfectly striped and shaped candy canes? Yes. Should I? No. Am I able to overcome my weirdness and let my kids attempt to unsuccessfully roll one of these bad boys into a candy cane sugar cookie shape? Yes, but I have to look away and reassure myself that they all can’t be perfect. Sheesh, I’m so weird. I hate how freakish I am when I make my candy cane cookies. When I divide the dough, I weigh it to ensure the white and the red are the same size. 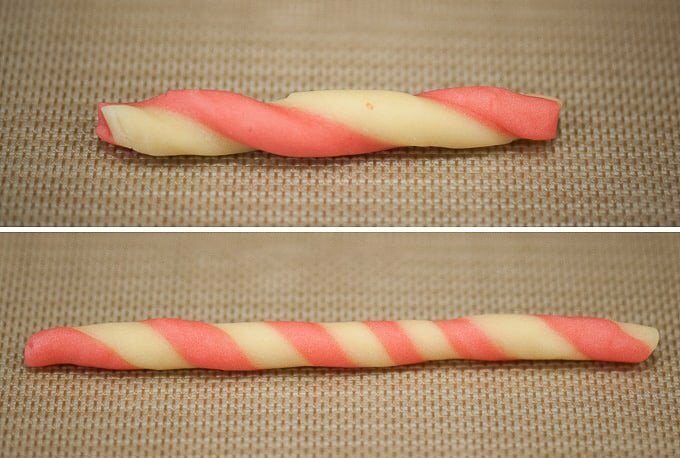 You might wonder if there’s actual peppermint candy in the dough, but the peppermint flavor comes from extract and not actual peppermint candy. I get crazy proud of myself when I can roll them out into a perfect square and then cut a beautifully straight line down the middle. I’ll give myself a high five when I can twist the cookie, roll it to uniform thickness with perfectly spaced stripes. Okay, okay, the examples in this post aren’t perfect, but you get the idea. The fun part is that you shape the cookies yourself rather than use a candy cane cookie cutter. And finally, I love to maximize my baking sheet real estate so I alternate direction when I bake the candy cane cookies. Total obsessive compulsive behavior. What can I say? The result is a perfectly crisp, yet perfectly soft, peppermint flavored cookie with just the right amount of sweet. 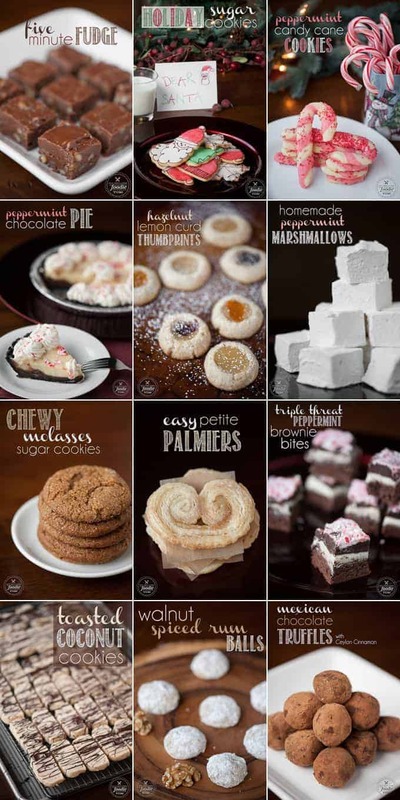 What do you consider the best Christmas cookies? 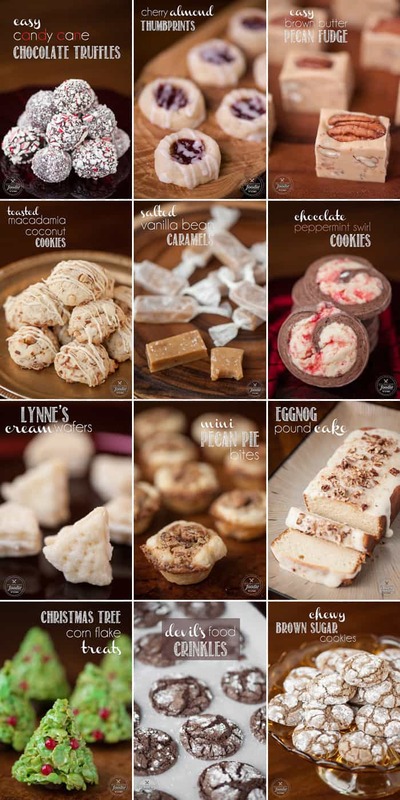 I’m always on the hunt for amazing Christmas cookie recipes, so please share your ideas and be sure to check out all of my Christmas treats at the bottom of this post! Kitchen scale: I started off using a 5 pound scale and quickly upgraded to the 11 pound scale. 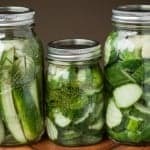 It’s worth it to have the larger size, especially if you garden and want to keep track of your annual harvest quantities! Baking Sheet: I’ve been using this one for years. I love that it’s made in the USA, the sides are high enough to keep anything from spilling over, and it’s warp resistant. Silpat Silicone Baking Mat: Any time I bake cookies, I always use my Silpat. Turn ANY pan into a non-stick surface and save time cleaning up! Rolling Pin: This is the best rolling pin I’ve ever owned. It has great weight which means you have to push less, and the handles are shaped to your hands. 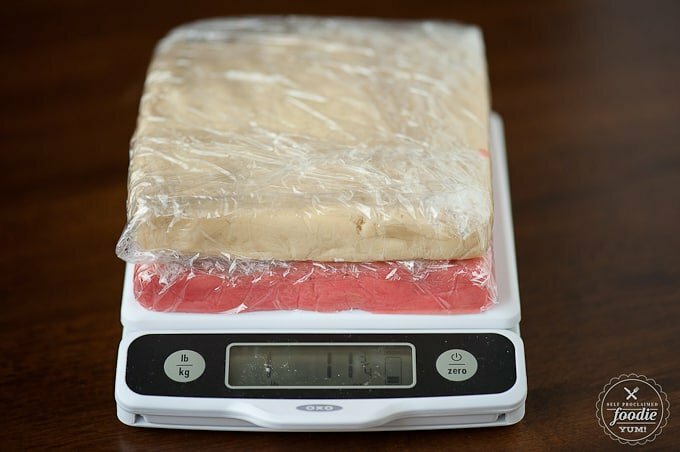 Roll each dough to a 9x9 inch square, then stack them on one another and roll to seal them together. Cut the dough down the center and refrigerate both halves. 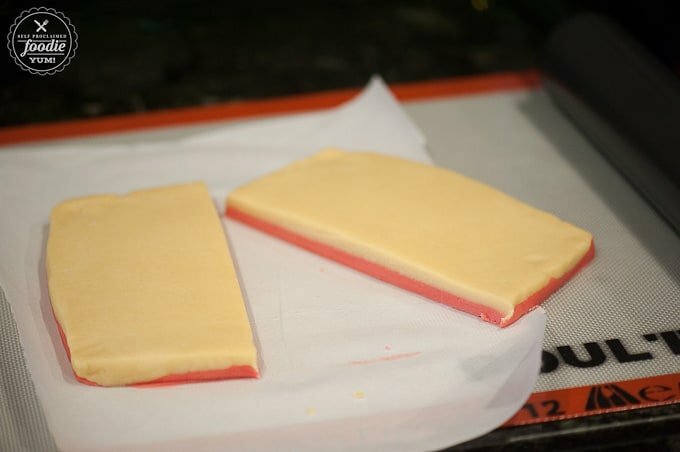 After the dough has chilled a bit, after maybe 15 minutes, take out one of the halves and start cutting short strips that are about 1/4 inch thick. 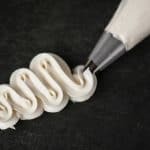 Roll each strip to lengthen and slightly twist at the same time. 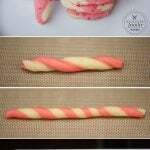 Roll in decorating sugar and then lay out on baking sheet in the shape of a candy cane. 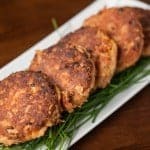 Hi Krissy, These look really good. I can’t wait to try making these with my daughter. She’s been baking with me for a few years now and loves it. We have our favorites but, I think this would be a great addition. Pinned for later. 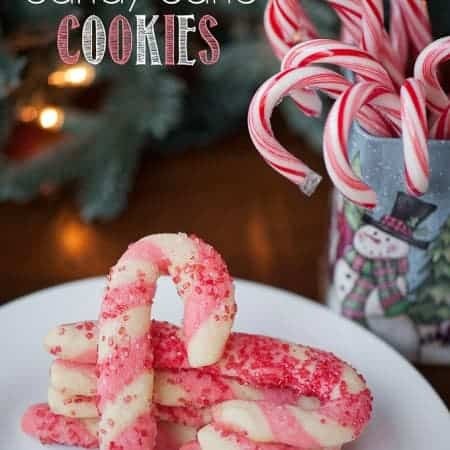 These candy cane cookies are so perfectly done and pretty! Hands down these are the best Christmas inspired cookies I have seen on the web lately. They look so cute and I bet they taste delicious too – pinned! What am I doing wrong. The dough is crumbly and the candy canes are breaking apart. These baked into a beautiful and lovely cookie. It may have been my peppermint extract, but using the amount in the recipe was too much for me. But it was nothing a little chocolate couldn’t fix. I dipped the bottoms in chocolate and it was a great combo. Thanks for the super cute cookie idea. My family will gobble them up next week for Christmas! Oh my! I never thought about how good these would be dipped in chocolate. YUM! These taste really good, but I could not get them to roll and stay together, and certainly not twist and stay together, and definetly not curve into a cane and stay together. The dough was sticky and slimy, even though I had it in the fridge overnight and cut, rolled, twisted very quickly. I ended up with white and pink sort of twisted peppermint cookies that spread out like crazy when baking. Wow…..followed directions exactly. My cookies totally spread all over. So disappointed as they are so time consuming. Kept dough chilled, kept rolled cookies in fridge until ready to bake, but still spread. Don’t know what went wrong. My cookies did not look anything like yours. Don’t know what I did. Maybe I’ll try next Christmas. Boo hoo. Sorry to hear that, Chris. Was the dough really cold? Even room temp dough will spread out into ugly cookies. Very disappointed that I gave this recipe a try, even after all the bad reviews. The cookies expanded so much, they didn’t even look like candy canes anymore, the dough was so sticky, which made it very hard to work with, and they crumbled as soon as I tried to pick them up to eat one. Should have found a different recipe. I’m sorry to hear that! I’m not sure why they didn’t work for you. I find that the colder the dough, the less they spread. Also, whenever I’m baking, if the dough seems too sticky I’ll always add enough flour to make them easy to handle. They worked for me… sorry they didn’t work for you! My dough ended up being very crumbly too, so I just swirled the two dough colors together and made round cookies (not as cute as candy cane but still tasty). I also like to make a powdered sugar frosting to drizzle on top and add crushed candy cane pieces to the frosting. Super tasty! Thank you for the recipe. My family enjoyed them. I made them with Earth Balance vegan butter and vegan egg replacer. 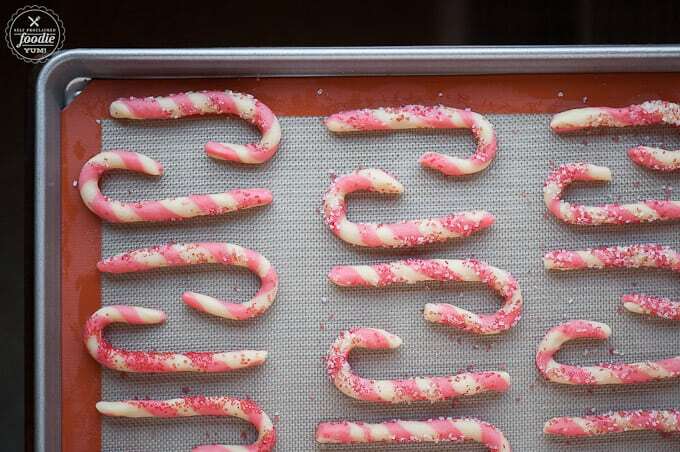 Rather than decorative sugar, I crushed candy canes in the food processor and pressed them into those crumbs before baking. Yum!